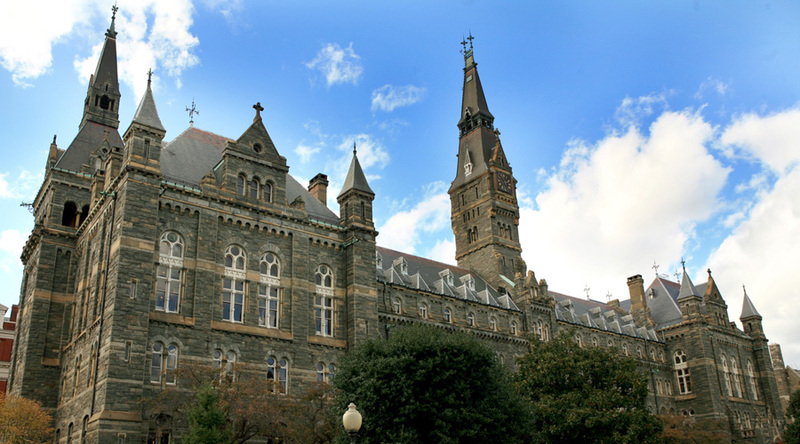 Students at Georgetown University demanded that the school’s President John DeGioia cut ties with sportswear company Nike, according to a report from the Guardian on the morning of December 8. The article explains that Nike’s contract to manufacture licensed Georgetown jerseys and shoes expires in December 2016, and students occupied the President’s office expressing that a renewed 2017 collaboration should be denied in light of revelations about poor conditions under Hansae, which operates Nike’s Vietnam factory. According to the Georgetown paper, the Hoya, the school currently holds Nike’s largest Air Jordan brand contract in the country. This is not the first instance of Georgetown student rebelling against their affiliation with the swoosh. In November 2015, student covered their Nike logos with tape as a symbol of their dissension with Nike’s labor rights in its factories overseas. Following the protests, in April of 2016 Georgetown President DeGioia issued a letter to Nike requesting the company agree to the school’s code of conduct, with includes a bundle of workers’ rights clauses. Most importantly in the code of conduct, it puts forth that all Georgetown licensees agree to the university-affiliated independent auditor Workers Rights Consortium. Are You Locked in to the Trade Show World of Yesterday?